As the last week has proven, the majority of everyone cares more about those high-priced, powerful phones that dominate headlines for weeks. Not only do those devices dominate headlines, but they also dominate our wallets. However, even with these high-profile devices taking our wallets hostage, there are more economical devices becoming more and more relevant. The OnePlus One shocked everyone with flagship-like specs while only costing about $300 for the base 16GB version. Naturally, the OPO was dubbed the flagship killer of 2014, and OnePlus just released their sequel, the OnePlus 2. However, in 2013, Motorola started hitting our pockets in a different manner. A few months after the release of the original Moto X in 2013, Motorola debuted the Moto G. The premise behind this device was to provide a very solid alternative to flagship devices which would be an easier hit on our wallets and make everyone think twice about getting those high-priced flagships. The past two years have been no different, and Motorola has really followed through on improving the Moto G since its inception. Motorola is trying to combine these mid-range internals while still providing one of the best experiences for a mobile device, while hitting a sub-$200 price mark. Speaking of those internals, let’s take a quick peek. 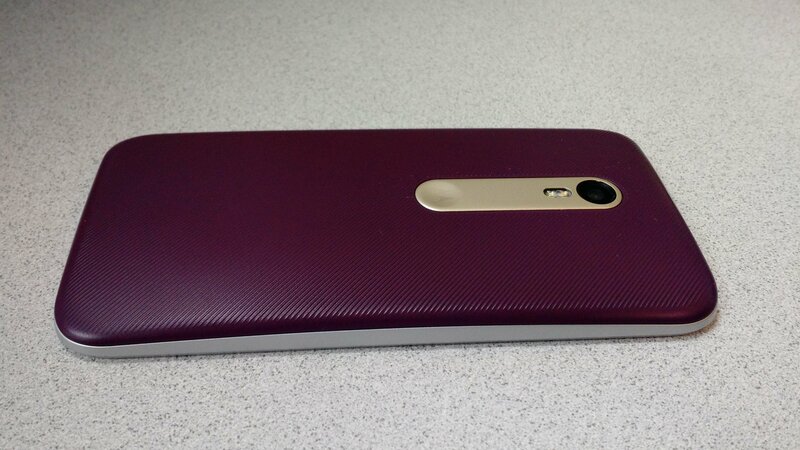 The Moto G doesn’t have the most impressive spec sheet, but that’s the point. Since their remodeling, Motorola has been trying to drive the point home about software integration by showing everyone how well these devices can perform without having the top of the line specs. The Moto G is the epitome of this new initiative.. I loved the feel of the original Moto X. I thought the smaller form factor, with the smooth back was a dream to hold and use. However, I have since switched to larger phones, and even though the Moto G 2015 is taller, this phone is feels really good in the hand as well. The back-plate has a textured feel to it, making it easier to grip, which in turn makes me worry less about dropping it. In fact, I never once felt that the Moto G was going to slip out of my hands and on to the ground, desk, or anything else. The back-plate does come off, and while you can’t replace the battery, you can get access to the microSD card slot, and SIM card tray. 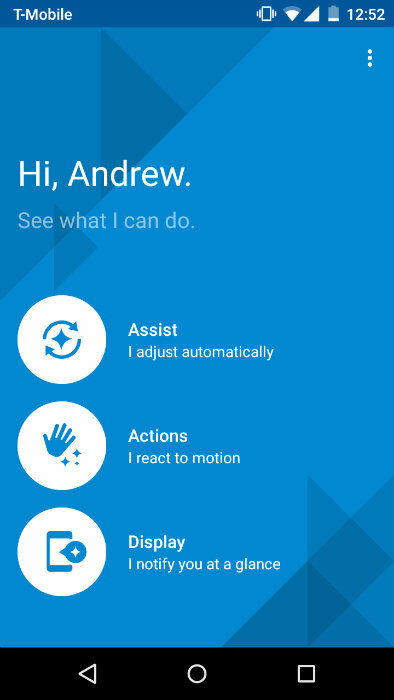 Motorola also is allowing users to be able to swap the backs around to suit your personal style. Be careful through all the switching and such, because this device is IPX7 water-resistant, you don’t want to forget to snap the back all the way on and get water damage in your device. Speaking of which, whenever the back plate is removed from your device you will get a notification stating that you need to ensure that the case is fully snapped on. This is to make sure that you won’t ever encounter any water damage on account of everything not being put back into place. The 3rd Generation Moto G is rocking stock Android 5.1 Lollipop with a few of Motorola’s added features. The biggest addition to the Moto G was the introduction of Moto Display. Moto Display was already introduced back with the original Moto X and basically has turned into an extension of your device. For those who are new to the Motorola game, Moto Display is a baked in replacement for your lock screen. 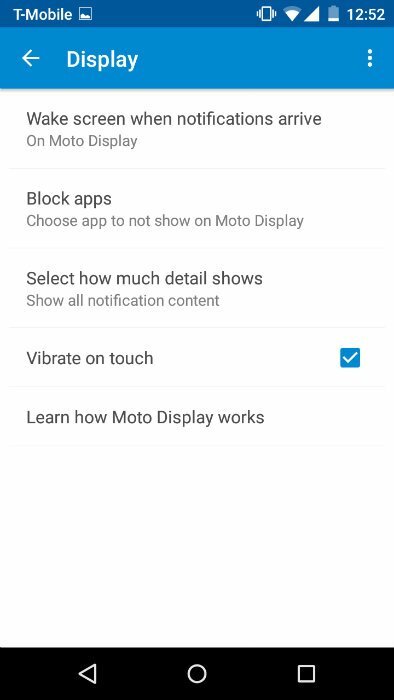 Instead of having to turn your display on every time you get a notification, Moto Display takes care of that for you. Once you receive a new notification, you are presented with interactive icons. 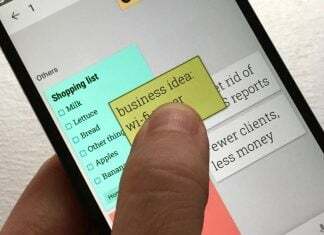 When pressed, you will see a preview of the message and either swipe up to open the application, or down to just unlock the device. Of course, you can just let the notifications pile up and view them one by one, without ever unlocking your device and wasting that precious battery life. 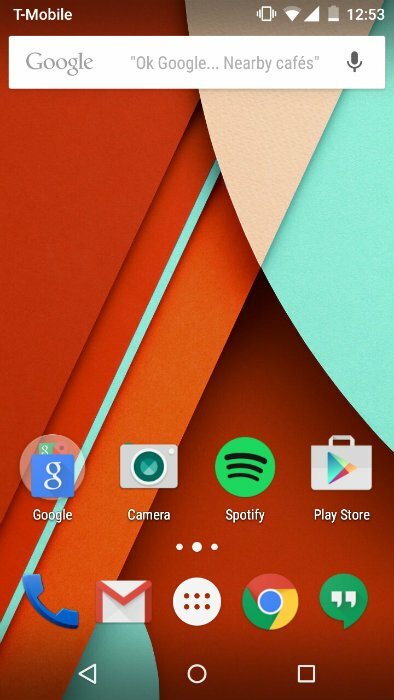 Out of the box, the Moto G is using Google’s stock launcher that was introduced with Android Lollipop. You don’t have to worry about any overlays or anything that is unnecessary while navigating through your home screens. What you do get is the goodies of stock software with SOME of the Moto Display features. 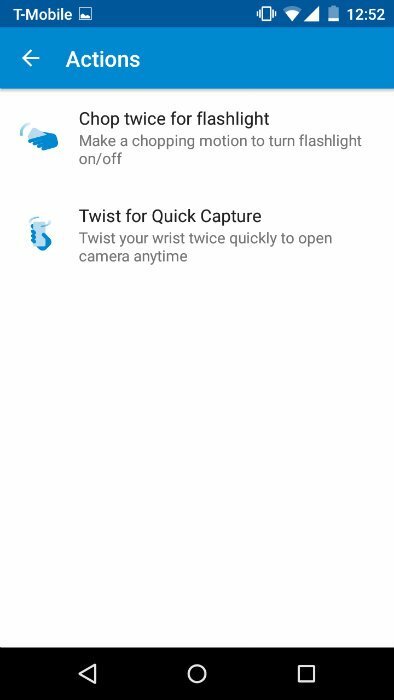 You also get the gestures for quickly turning on the flash light (chop-chop) and activating the camera (flicka-da-wrist). In my time with the Moto G, I never experienced any lag while navigating the home screens, scrolling through my apps, or switching quickly from one app to the next. I did experience a bit of stutter when I played Mountain Goat Mountain, but since that game has the ability to change the frame rate, I just bumped it down and kept going stutter free. However I did play hours worth of Riptide GP 2, which is graphically challenging, and never had a single issue. Even when I was playing for hours, the back of the phone only felt warm, and was never uncomfortable. Speaking of the battery, it’s amazing. While testing the Moto G, I never once ran out of battery, and there would be times I would take it off the charger at 530AM and would still have about 20-30% of battery left at midnight. The battery really impressed me, and I’m not sure if it’s a combination of the lower-res display with the Snapdragon 410, but I couldn’t get over how much I could use the G without it running out of juice. I would deliberately try and run the battery out, and only succeeded after using the Moto G for tethering capabilities with my laptop while I was out and about. There also were never any issues encountered with random battery loss from standby time. 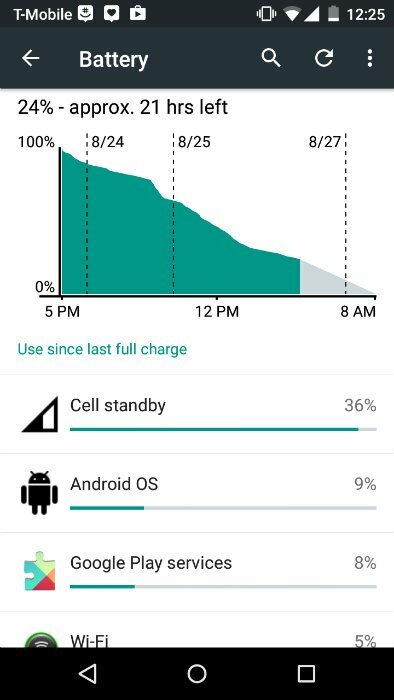 The Moto G is a beast in just about every manner when it comes to the battery. One thing to take note of with the 2015 Moto G: there is no quick charge capability built-in, so you can’t get that extra fast charging when you’re low on power. However, with the stunning battery life on this device, the chances of you needing quick charge, is slim-to-none. I wanted the camera to be better than the one found in the Moto X 2014, but it seems that it’s more on par with that camera. The camera is definitely nothing spectacular, and you can tell as soon as you try and take your first picture. The built-in camera software is still a little off when it comes to focusing, and unless you try a different app, you’ll have to just hope you can get the picture to focus at the right time. It definitely felt like I was playing a game of cat and mouse when it came to trying to focus, but we knew that going in. Hopefully, Motorola can get their stuff together and make the app better while removing the focusing issues. As stated above, the camera is nothing to write home about, but for what you get in an 13MP camera, you can’t really expect too much. This will do just fine with your run-of-the-mill pictures, but they won’t be “featured” in anything important. I would say that the camera is perfect for the price range that the Moto G is set in. When Motorola was generous enough to shock the world with Moto Maker for the Moto X everyone was super stoked about it. You mean to tell me I can customize my device to the T, and don’t have to settle for just black or just white? Well Motorola did something pretty awesome with the Moto G 2015. 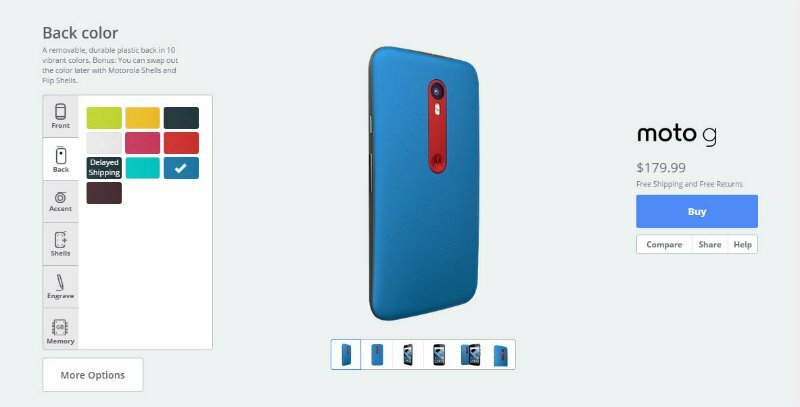 After bringing Moto Maker to the Moto 360, and the Moto X, you can now customize your Moto G on Moto Maker. With a slew of different combinations, Motorola really has taken customizing your device to a whole new level. There are two color options for the front, 10 different options for the back-plate, and 10 different options for your accent color, the possibilities are endless. The Moto G 2015 follows in the steps of its predecessor and big brother, by offering a great combination of specs, decent camera, and customization options to bring one of the best mid-range devices to the forefront. Now, just as a note, there are two different variants of the 2015 Moto G. The first is one that features 8GB of storage with 1GB of RAM for $179, or the version that was reviewed today with 16GB of storage and 2GB of RAM for $219. If you can afford the extra 50 dollars, I would definitely opt for the extra storage and extra RAM so you can have that extra boost when you need it. No lag is always a good thing, and you won’t have that issue when it comes to the 2GB variant of the Moto G 2015. With the introduction of these mid-range specs, addition of Moto display features, and the inclusion of the Moto G to Moto Maker, the Moto G really deserves a chance. Let us know what you think about this awesome device from the folks at Motorola in the comments below.